Thanks to Brenda Magee , for sending me the following, Brenda is a 4th great-granddaughter of Beacham RHODES. Also see: Descendants of Beechum Rhodes and Rhoades/Rhodes/Roads/Rodes'/etc that served in the American Revolution, to read more about Beacham. This article about Beacham RHODES was in the Feb. 28, 2000 issue of The Ledger Independent in Maysville, KY.
George STOCKTON settled his family in Fleming County in 1788, in a fortified position he referred to as Mount Pleasant, but known locally as Stockton's Station, located on the outskirts of present day Flemingsburg. Stockton had been raised by Indians near Niagra Falls in northwestern New York before first coming to Kentucky in 1766, on an exploratory and surveying expedition. He moved his family to the vast wilderness in 1788. His was the first family to settle in Fleming County. During the move and the first year of settlement of the station, he relied heavily upon the assistance of his oldest son Robert, an intelligent, strong, cheerful young man he was immensely proud of and who he had named in honor of his own father, and the boy's grandfather. On Valentine's Day, Feb. 14, 1789, Robert STOCKTON, 17, rode out of Stockton's Station, with his new friend from a distant settlement named Beechum RHODES. Both of the young men were desirous of having a successful bear hunt in eastern Fleming County. That region of the frontier was famous for its remoteness and good hunting prospects. Stockton wanted to obtain several bear skins to later trade with French trade vessels that traveled the Ohio River and often landed at present day Maysville, then called "the point". He planned to give these traded items such as salt, sugar, coffee and gunpowder to his family and other settlers of the area. Robert's father was away on business near the Kentucky River at the time, and Robert felt this would be a fine opportunity for him to shoulder some of the burden of responsibility and provide a few of the much needed commodities for his family and friends. The two young men arrived at their base camp near present day Bell Grove in eastern Fleming County, and after preparing the hides of the bears they had taken that day, they built up the fire and fell asleep. The two fine hunting dogs of his father curled up next to Robert, as they often did on such expeditions, and because of the labroious fights they had participated in with several of the bears taken that day, they immediately fell into a deep sleep . The role such dogs played in connection with pioneer families was more than pet, a family dog was part protector, provider and blessed companion. A family dog was indeed part of the family. In the darkest of night, the small band of Indians crept up to within feet of the campfire and simultaneously fired their muskets into the two sleeping lads. The effect of the gunfire was devastating. Robert STOCKTON was struck several times, but managed to grab his musket, get to his feet and point the weapon at the closing marauders before being overwhelmed by his wounds and falling to the ground dead. Beecham RHODES was struck twice in the upper portion of his right leg, near the groin. He managed to raise himself to his feet and dive into the shadows of the campfire and then crawl into a nearby tributary of Fox Creek where he fought to remain conscious, hidden and alert enough to avoid drowning. The marauders barely had time to congratulate one another on such a fine waylaying, when they were savagely attacked by the two Stockton dogs. So vicious was the attack that the Indians fled without recovering any plunder except the two young lads horses. Several of them were bleeding from their wounds as they rode off with one of the dogs still racing along and lunging at them. RHODES listened to the group ride off with the dog following and angrily barking and growling as he pursued. RHODES passed out from the pain and loss of blood from his wounds soon after that. In the morning, RHODES found himself partially submerged in the frozen stream . He clawed his way to the bank where he examined his wounds and managed to stop the wounds from further bleeding. He had broken no bones but the wounds were quite horrid. He could not move his right leg. He crawled to near where STOCKTON lay but did not get very close because one of the dogs had lain down on the body of the young man and growled savagely at RHODES when he came within feet. RHODES could not get close enough to the body to retrieve either of the forgotten muskets for fear of being torn apart by the dog. He assessed the situation he found himself in. It was fairly bleak. He was 15 miles away from the nearest source of help, had no weapon, no horse , no food and was horribly injured and unable to walk or even stand. It was also unseasonably cold for February. With a fierce determination, so prevalent in the founders of Fleming and surrounding counties. RHODES took the only course of action available to him. He began to crawl towards Stockton Station 14 miles away. He dragged himself forward using his hands and one good leg, refusing to quit and accept his death. He continued at his pitifully slow pace for seven days and nights, never stopping for fear of being unable to continue if he ever did . On the evening of the seventh day he had managed to cover 14 miles and was within one mile of the station, but was forced to stop at the banks of Fleming Creek which lay between him and his destination. Recent rains had flooded the creek and he knew he did not have the strength required to cross such an obstacle , he reluctantly accepted his apparently sealed fate and crawled onto a nearby path to die. He hoped his body would be discovered by hunters before being devoured by wolves. He was very near death when Samuel REED, a hunter from Stockton's Station found him. REED immediately picked him up, swam the flooded creek and carried him the remaining mile to the station. Considering that REED was a small man and RHODES was a large man made the task even more difficult than would seem. George STOCKTON, Michael CASSIDY, Zadock WILLIAMS and several other of the inhabitants of the station rode out to the campsite to bury the son of their leader and their dear friend. They found the boy where he had fallen. The dog was still faithfully laying atop his companion. The earth all around the body was rorn and scratched, and the number of wounds upon the dog made it evident to all in the party that the dog had protected his master from several wolf packs. 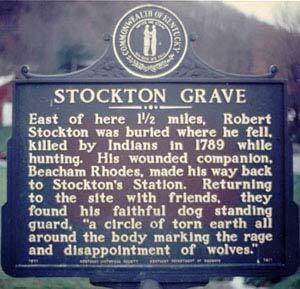 The body of Robert STOCKTON had not been touched by them, and it was only by the combined efforts of all present after several attempts that they were able to removed the dog from his master's body. The poor creature was out of its mind with pain and misery and would not listen to the commands of the elder STOCKTON but still tried to protect the boy's body. They buried the boy where he fell, wrapping the body in a clean sheet his mother had provided for the sorrowful task. When the job was complete, the men rode back home. More than once during that long empty ride, the men nearest George STOCKTON slowed their horses down a bit, giving their esteemed friend privacy. The sight of the huge, sobbing, frontiersman slumped in the saddle and gently stroking that poor bloody dog was more than even the roughest among them could bear witness. The lamentations of both dog and man echoed through the ancient forest. Beechum RHODES lived, and eventually recovered enough to became a militia scout. The dog that the men brought back to the station was nursed back to health along with the other dog that had chased the Indians and later returned home. They both lived many years and were treated deservedly as heroes. The tributary of Fox Creek where Robert STOCKTON was killed and buried still retains the name Stockton Creek.